You may remember from previous years that each January, I select a guiding word to see me through the year. It’s an idea I pinched from my Canadian friend, Jen Gilroy, whose word this year is COURAGE. This is my fourth year of choosing a guiding word. My first was APPRECIATION, which was tied in with having moved to North Wales, the place I had dreamed of living in ever since I was a child, and also in memory of a friend who died young, but whom I was able to write to while she was ill to share memories of our long friendship and tell her how much I valued her. The following year, I chose ANTICIPATION, as that was when I worked hard to get the fourth draft of The Deserter’s Daughter completed so that I could start approaching literary agents. Then, last year, my word was APPLICATION, which was very much on my mind at the start of the year as I faced a six-month deadline to get my next novel, A Respectable Woman, finished. I’ll be honest. This year, I’ve dithered over whether to share my word publicly. My word is ACCOMPLISHMENT and I’m concerned you’re going to think it sounds big-headed, but here is how it came about. I know I’ve got to work hard this year and to begin with, I was going to use ACHIEVEMENT, but I feel that ACCOMPLISHMENT not only covers achievement, but also suggests a sense of quality. I had the importance of quality drummed into me by a former boss, the late Mrs Wendy Drewett, who used to run the Children’s and Schools Library Services in the county where I worked. So what work aims do I have for 2018? Well, writing – obviously. I have been asked several times recently about what I am currently working on. I can’t say much at the moment – only that I hope to have news to share with you before too long. But I can share my new dedication to word count targets(!). After watching my word count graph rise throughout November when I, along with a number of writer chums did NaNoWriMo, I am determined to set a word count target every week this year. So far, I have hit my target in weeks 1 and 2; and at the time of writing this, I look set to meet week 3’s target. 3 weeks down, 49 to go! On the subject of work, my day job is going to vanish from under my feet at some point in the next few weeks. Gulp. More about that when the time comes. Not all my ambitions are fixed on writing. This year, I want to get the garden up to scratch. 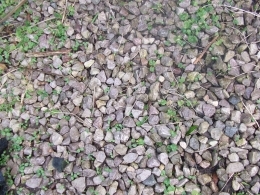 We have a gorgeous house, but the people who lived here before us didn’t like gardening and were heavily into reducing the work-load, which they did by putting down weed-suppressing membrane over the flowerbeds and covering it with several tons of grey pebbles. For me, one of the joys of life is turning over the soil, so I have been gradually getting rid of the stones. Some of it I’ve done myself, some I’ve paid others to do; but it feels like a never-ending job. The roses are no longer in the tubs. After this picture was taken, they were planted in what I turned into a flowerbed and I’m pleased to tell you they are thriving. Meanwhile in the front garden, having removed some enormous shrubs and bushes whose main purpose in life seemed to be to drape lovingly around the postman every morning, this is what is left. Those grey stones are up to six inches deep. Later this year, I will take another picture of this corner – minus stones and with new shrubs (hydrangeas, possibly) growing in lots of lovely soil. So there we are - a look at the year that lies ahead for me. What plans do you have? Or do you avoid making resolutions? Thank you for your kind comment, Tara. Lovely to hear from you. I'm glad you like the look of the garden. I hope it is going to look a lot better by the end of the year. I really like the idea of a guiding word and I’m glad you shared yours. You should definitely be proud of all you have accomplished and I know there’s more to come! Love your garden too. 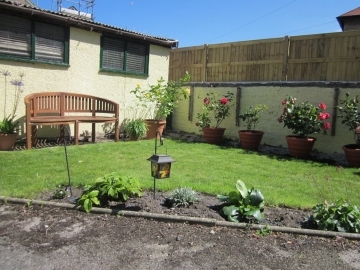 You are quite right, Louise - the back yard did look very sombre, not to say grim, when it was covered with the pebbles. I much prefer it now that it is more of a garden. I'm pleased you enjoyed the blog. Thank you for your good wishes. An interesting blog. I hope you have a successful year and that your good news, whatever it is, comes to fruition. I love the idea of getting rolls of turf as a birthday present. 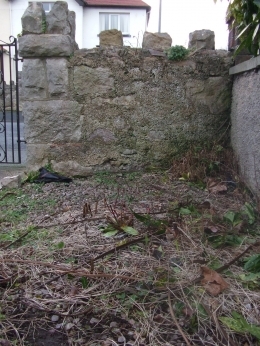 The back yard-turned-garden must have looked very grey when it was covered in stones. It looks like you have added quite a bit of colour. I hope you get all the other stones removed. Good luck! I love this idea - having a word to define your year ahead, would really have focus, but encompass so much behind it. I've given it some thought and I feel BRAVE is mine... I need to be brave in writing my book to ' the end', brave to share my art and illustration, brave to start blogging again, brave in so many other areas for 2018! Thanks for sharing Susanna ~ Accomplishment is a good word too... I so need to sort our garden out as well, it's suffered because of my back troubles and I love gardening, so it pains me to see it in such a state!